A company, whether privately owned or owned by a group, needs to have a brand which is the name, term, sign, symbol or design, intended to identify the goods and services of the company, which in turn helps it stand out from the crowd. Many times small businesses find it hard to market their brand and gather the right following on social platforms. This is when an experienced entrepreneur and someone who has the unique ability to find creative ways to market your business would come in handy, and that is where Go Be Social Media, LLC comes to your rescue. The founder of Go Be Social Media, LLC is Jennifer Hurless, a well-recognized career expert who has nearly a decade of social media and online marketing experience specializing in brand relations, content marketing and creative content for optimal organic SEO results. Alena Chandler is talented with finding the right voice for each client that fits their brand and reaches their target audience. She has 12 years of experience in online communication and social media and has assisted small businesses with their marketing and public relations, helping growing their business in a way that optimizes their strengths. Go Be Social Media evaluates each company or individual and proceeds to put together a unique and creative plan for your business which includes logo creation or revision, all business stationery, website solutions from designing to building and populating your website and blog to make a unique place for your customers to visit online. Public Relations work hand in hand with social media so if you need a presence on social media sites Go Be Social Media can handle all posts made according to your specifications or train your staff on how it’s done. Using facebook ads and google ad-words can be effective as well and we will make sure it works for your business. 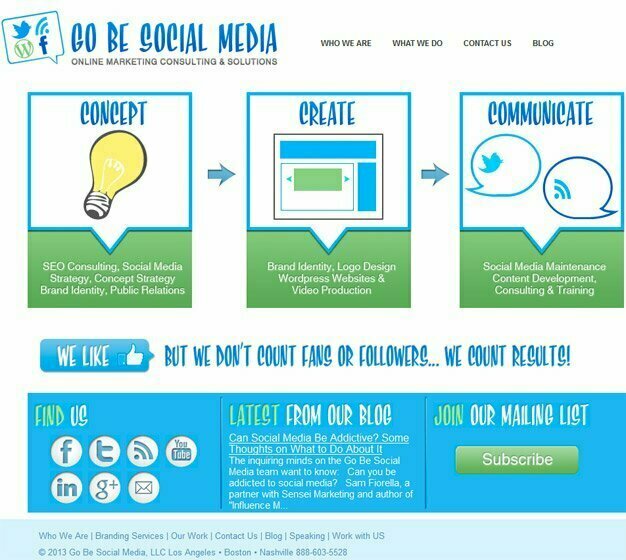 In creating a website for Go Be Social Media, Pulse used WordPress for a simple, effective social media look that captures the intent of the business. MySQL is extremely fast and is widely used for supporting WordPress, with PHP working behind the scenes, to create a bold look that grabs your attention but is easy to navigate. With a unique website, Go Be Social Media can concentrate on fulfilling the marketing needs of countless companies in a smart, creative manner.